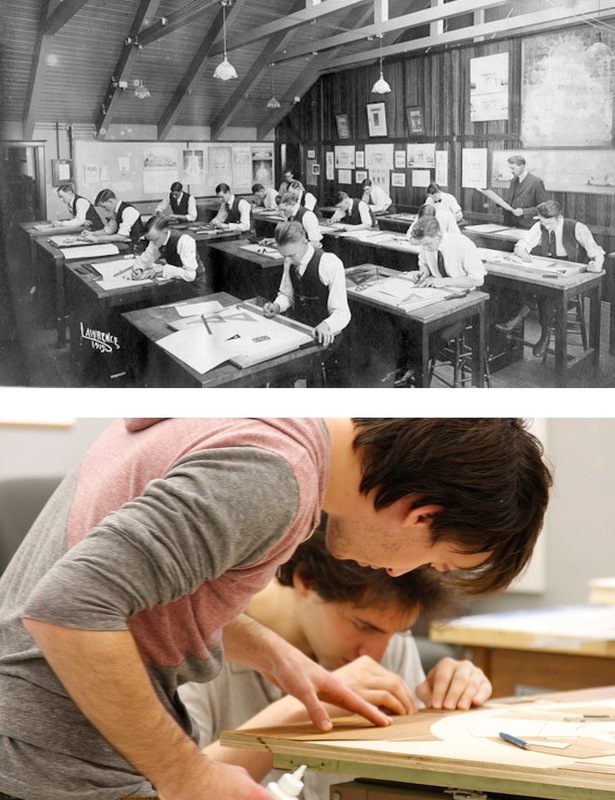 Although these photos were taken almost 100 years apart, both generations of KU architecture students have one thing in common: They’re working in Marvin Hall. The program that has evolved into today’s School of Architecture, Design & Planning began in 1912 when the Kansas Board of Regents authorized the University to create an architecture program within the School of Engineering. This makes KU’s architecture program one of the oldest in the country. Marcus Whitten was its first graduate, in 1916. Following an accreditation visit in 1967, the National Architectural Accrediting Board recommended to the University that its architecture program become an autonomous school within the University, apart from the School of Engineering. Shortly thereafter the School of Architecture and Urban Design was created. It had its own studios, classrooms, and library in Marvin Hall, as they are today, and its staff reported directly the University's administration. In 2010 the School of Architecture and Urban Design became the School of Architecture, Design & Planning. The change reflects one of the most important events in the School's history, the formation of the Department of Design. Today the School is home to approximately 1,000 students. This modest size engenders a sense of community among our students, and allows for small classes and highly individualized instruction. The Department of Architecture offers Bachelors of Architecture Studies, Masters of Architecture, Masters of Arts in Architecture, and PhD degrees. Our graduates are known for their design acumen, mastery of architectural technology and construction, and skill in environmental analysis. Our final year options include the Studio 804 design-build program, specialization in Health and Wellness Architecture, and internships in architecture firms overseas. We also offer a graduate certificate in Facilities Management. The School’s Department of Design offers students foundations in the practice of design thinking and visualization to create beautiful, innovative solutions that enhance the quality of everyday life. Our Center for Design Research does research for Bayer Healthcare, Garmin International, Ford Motor Company, Sprint, and others. We offer Bachelors of Fine Arts degrees with specializations in environmental design, illustration and animation, industrial design, photo media, and visual communication design. We also offer Master of Arts degrees in environmental design, design management, and interaction design. Our Department of Urban Planning offers a Master of Urban Planning degree. We emphasize policy planning and analysis within the context of urban environments. Our graduates are equipped to analyze, create, and implement policies at all levels of government and the private sector. Students may concentrate their studies in planning for housing and development, land use planning and urban design, transportation planning, and environmental planning. Additional degree options include joint degrees in American studies, architecture, architectural studies, business, geography, and law. After more than 100 years KU's School Architecture, Design & Planning continues to maintain a rich tradition of excellence in education of which it can rightfully be proud. For more information about the School of Architecture, Design, and Planning visit www.sadp.ku.edu.